The students toured a variety of programs on the Hays Campus including welding, nursing, electrical, culinary, business and carpentry. The opportunity to show students hands-on application of programs is often key to their success. 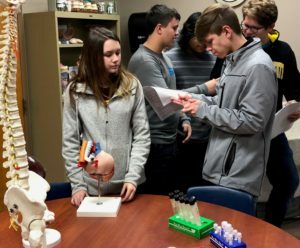 The JAG-K program explores career opportunities and focuses on soft skills to prepare students for the next level, whether it be education, the workforce or the military. An essential part of NCK TECH’s curriculum is focusing on job preparedness for all students. Soft skills are implemented into all programs of study. If your organization or group is interested in visiting NCK TECH, schedule a tour on the college’s website at www.ncktc.edu.